Shaw, Murray C.. "Kathy Kreiner". The Canadian Encyclopedia, 04 March 2015, Historica Canada. https://www.thecanadianencyclopedia.ca/en/article/kathy-kreiner. Accessed 25 April 2019. She won Canada's only 1976 Olympic gold medal - in the giant slalom on 4 Feb - for which she was considered a long shot against gold-medal winning German skier Rosi Mittermaier. In so doing she became the youngest-ever gold medalist in skiing to that date. 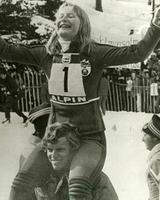 Kathy Kreiner's gold medal-winning performance the 1976 Winter Olympics at Innsbruck, Austria(courtesy AP). 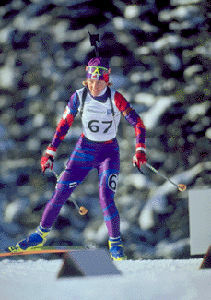 Kathy Kreiner, alpine skier (b at Timmins, Ont 4 May 1957). 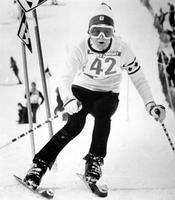 Kreiner began skiing at age 3 and racing at 7. Inspired by stories of the 1968 OLYMPIC GAMES told to her by her father, a former Canadian ski team doctor, Kreiner hoped to one day achieve the level of success of skiers Nancy GREENE and Anne HEGGTVEIT. At 12 she was the youngest-ever winner of the prestigious Mt Tremblant Taschereau race in Québec. She began World Cup competition at 14, the year she joined the national team, winning her first World Cup race at Pfronten, West Germany, in 1974. 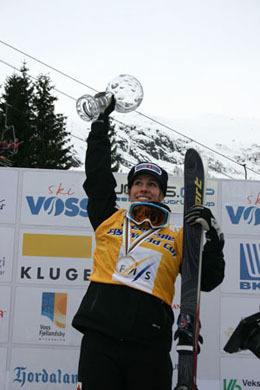 At 16 she won her first World Cup in the giant slalom, a full second ahead of the silver medalist. She won Canada's only 1976 Olympic gold medal - in the giant slalom on 4 Feb - for which she was considered a long shot against gold-medal winning German skier Rosi Mittermaier. In so doing she became the youngest-ever gold medalist in skiing to that date. For her achievements, Kreiner was named Canada's top female athlete (the Bobbie Rosenfeld Award) and was inducted into CANADA'S SPORTS HALL OF FAME that year. Overall, 1976 would be her most consistent season, and in the years that followed she was unable to reach the podium again at the world level. In 1981 Kreiner retired, having won a total of 5 gold and 6 silver medals in Canadian championship events and earning 22 top-ten World Cup finishes in addition to her world and Olympic gold medal performances. Following retirement she pursued post-secondary studies, earning a master's degree in sports psychology from the UNIVERSITY OF OTTAWA. She is currently a mental trainer, helping those athletes aspiring to top levels of competition acquire the psychological tools to excel.